Designed by the legendary Greg Norman, the 7,000 yard layout is unique -not just to this country but to the entire golfing kingdom. As its name suggests, El Camaleon is ever changing. The course bends through three distinct landscapes -dense jungle, mangrove forests, and stunning, oceanfront stretches of sand and is bisected by massive, limestone canals. Norman has even incorporated a cenote, an ancient underground cavern and river system into the center of the opening fairway. Take the chance to play in one of the most impressive and beautiful golf courses of Mexico. The Hilton Golf Club offers a true Caribbean atmosphere, located at the heart of the Hotel Zone of Cancun and surrounded by Mayan vestiges, lush mangroves flora and exotic wild life including crocodiles, iguanas, wild peacocks and several tropical birds. Created with a profound respect for the abundant wild life and vegetation of the delicate ecosystem that surrounds the area. It features several lagoon and ocean front holes and 4 holes actually play from or towards the beautiful white-sand beaches and turquoise colored water of the Mexican Caribbean Sea. A professional par 72 course, is renowned mainly for being the most challenging one in southeastern Mexico. Designed by Robert Von Hagge with narrow fairways and small greens, it is surrounded by lush jungle, archaeological vestiges, and natural clear water sinkholes. 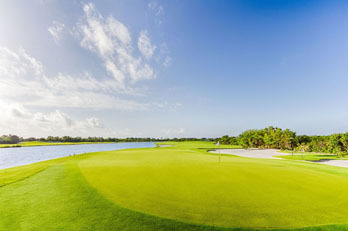 Located at the Rivera Maya at the Playacar development is a unique experience to enjoy a golf in the Mexican Caribbean. Opened in the middle of September 2008, Jack Nicklaus has done remarkable job carving this gem using the natural contours of the terrain, this course boasts strategic bunkering, immaculate greens, wooden bridges and the peaceful tranquility of the natural reserve that surrounds the course. Golfers will also enjoy the ocean views on holes 14 and 15. Under the auspices of the renowned PGA champion and golf course designer, Nick Price, the Grand Coral Riviera Maya boasts a magnificent 18-hole golf course where golf pros and amateurs alike can while away pleasant golf days only steps away from the breathtaking Caribbean Sea. Iberostar Playa Paraiso Golf Club, a Dye family creation that is ranked 16th BEST course in the Caribbean and Mexico by Golf week magazine in 2012. Home of the Canadian Tour Ibersotar Riviera Maya Open and the host site of the PGA Tour Monday qualifier this course is a must play if you are a golf and nature enthusiast. Immersed in the ancient Mayan jungle, this course characterizes by its vertical movement and distinctive natural rock work making this course a true “one of a kind”. This world class lay out features course conditions only seen at the best golf destinations around the world and has become one of the favorite courses in the Riviera Maya / Cancun area. El Tinto Golf Course at Cancun Country Club will become the new standard of excellence in Latin America. Attention to detail, world-class service and amenities, and a professional, friendly staff-the hallmarks of private golf clubs throughout the world, until now. Environmental awareness was integral to the design and development of El Tinto Golf Course. The course boasts wall-to-wall Platinum Paspalum, the Cadillac of grass in this region, as well as 84 bunkers and 5 lakes.